Well I am excited today as I have our first 3 D file ready for the low cost 3 D printer. We have tested the file by printing it on the existing high end 3D printers and can’t wait to see how the low cost printer makes the model from the same file. The series of photos below this paragraph shows you how to use the jig to find and draw center on the end of a dowel piece. Here is an update the jig can also be used to check the 90 degree corners of your newly constructed boxes. Hi. My name is Dave Richards. I’ve been using SketchUp since 2003 mainly for woodworking related projects. I purchased the program before there was a free version available and justified it as another power tool for my shop. I discovered early on that SketchUp makes the time I spend in the shop much more effective. I create less waste and I have a clearer idea of what I need to do at each step of the project. On top of that, I find that SketchUp is an amazingly powerful communication tool. When I am working on a project of my own a nice perspective drawing is much easier for my wife to read that 2D drawings which would be just fine for my own use. 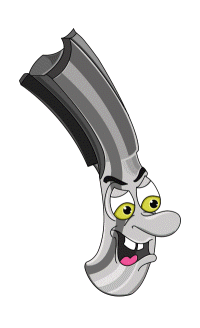 At the time I started using SketchUp there weren’t very many woodworkers using the program. there were a few of us though and more were coming on board. I started tutoring others in how to use it and when Google bought the program and made the free version available, it really took off. Since then I have been helping woodworkers around the world learn to use SketchUp. I’ve helped woodworkers through various forums both in the US and internationally. I do one-on-one training both live and online with desktop sharing software as well as teaching classes in the local community education program. I’m also a contributor to the Design. Click. Build. 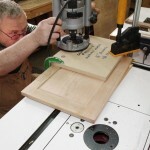 blog on FineWoodworking.com and just recently, I released SketchUp Guide for Woodworkers — The Basics which is available from Fine Woodworking as either a DVD or as a download . In addition to teaching others how to use SketchUp, I draw woodworking projects and create plans that others will use to build the pieces. For some of my clients I will start with vague description and create some design options. After the client settles on a final design, I convert the design into plans. For several years I’ve also been drawing plans for Fine Woodworking’s Digital Plans Library. These plans are downloadable in PDF format and include the SketchUp model. If you download these plans, you can build directly from them or use modify the SketchUp model to suit your needs and build from that. 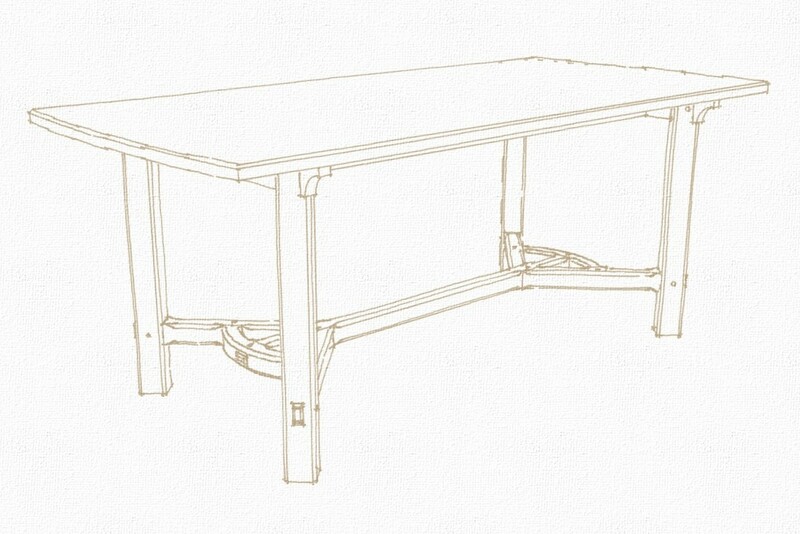 All in all I find SketchUp to be a valuable tool for woodworking. It is easier to learn than even 2D CAD programs. With it you can create nice drawings to present to your client and use the same drawing to create the plans you’ll use in the shop to build the project. I just reviewed another episode of the Router Workshop. These guys have the best outlook. They use the “KISS” method the majority of the time which is great for us novice router users. Episode 105 continues where the introductory box joint video left off. Bob constructs a simple angled clock, using the same 3/8” box joint jig as before. Using (you guessed it), angled box joints and a very simple shop made jig. 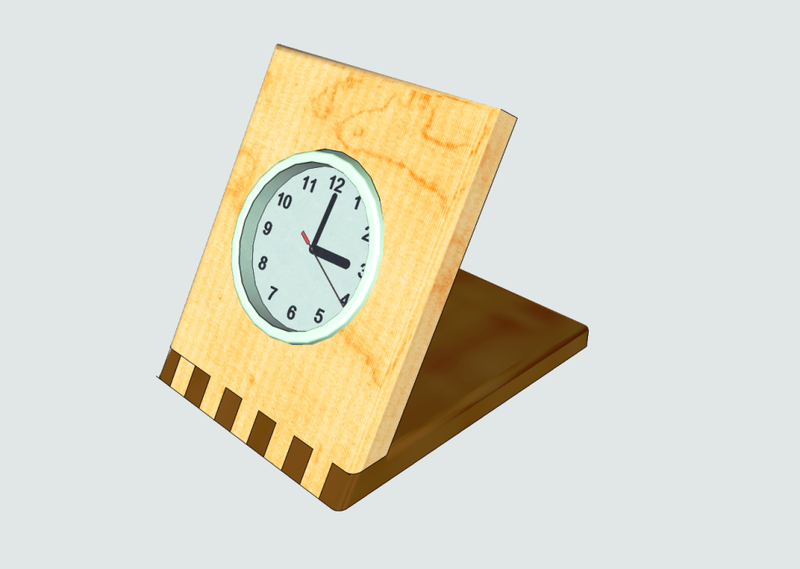 This time he adds a clock and makes a very distinctive desk or table clock which anyone could use or sell.  Bob’s techniques and methods are very well explained and easy to follow. Bob’s setups are so basic and easy to understand and he never uses a tape measure. After watching this video I have every confidence even I could build this. In the remainder of the show Rick reviews the lesson learned and then demonstrates an easy way to make your own molding for the bottom of a mirror in his case but this same process could be used in many applications that I can think of. Next he demonstrates making your own doweling so that you can match materials you are using in your project. As we are all aware, doweling is available in a limited number of materials and quite often not a consistent diameter. This will definitely come in handy. Another great video jammed packed with technique and ideas. Well it has been over 5 years that I have had access to a 3D modeling package called SolidWorks and 3 years ago we had acquired a 3D printer that is used to create a solid plastic piece from the modeling software. Yes you draw the project piece then convert to 3D print file and create the model out of plastic. The only downside to these files and printers is the cost to make a model, approx. 20 bucks an cubic inch…not practical for woodworking. The 3D printers are evolving into a printer for the home. I just received the email about the new 3D printer coming out this spring called Cube Obyssey…check it out at this link FYI: Cost of the printer is $1,300.00 and the plastic is $40.00 per cartridge with 10 colors to choose from…See where the Cube is traveling in the USA.. This is a great new look for the many uses of the router because now we can create 3D models for the Jigs and Fixtures at a reasonable price. The only thing we are missing is the 3D models of the Jigs and Fixtures. Now there is a method to use the 3D models to make the router more efficient and cost effective. This post is checking to see if anyone is currently drawing 3D models and using them in their woodworking projects? As part of the introduction series Bob and Rick discuss router safety and constructing a simple box. Using a table mounted router the old master (Bob) discusses the components of a simple box and joinery used to construct the same. Bob demonstrates the proper fence to use, how to construct one for yourself and isolating the bearing on the route bit. He then demonstrate the proper mounting of the bit in the router and the easy method of setting bit heights and finding centre on your work piece. He also explains why you should use a brass bushing to take up excess space around your bit for safety sake as well as when you should be using a safety start pin. Bob then proceeds to demonstrate a very unique and interesting way to cut the lid off the box and at the same time forming a lip that meshes with the bottom and completing a perfect six sided box for any variety of treasures. I can’t forget to mention Bob’s fine adjusting tool that every woodworker shouldn’t be without. Rick wraps things up with a review of the different setups for this project and safety precautions that should always be observed. Well today we are going to give you all the basic description of each of the Jigs and Fixture lessons. Yes, instead of me rambling on about why you should buy this E-Class I have decided to get Bruce Beatty a fellow woodworker give me his first impressions of the entire course. Before we do that I want you to meet Bruce in his workshop. My name is Bruce Beatty I’m just a couple of years away from retirement from my position as Training Officer with our local fire department in Orangeville, Ontario. I’ve been woodworking as a serious hobbyist for about 12 years now. I’m married with three grown boys and now 3 grandchildren. I used to work out of a single car garage until 5 years ago when I built a free standing 24 x36 shop. I now have a shop full of equipment and spend most of my spare time there. As far as routers I have 2 Porter Cables, 1 Dewalt and a Ridgid palm router, with a Jessem router table top and a homemade base cabinet. There hasn’t been a project go by that didn’t involve router work at some point. I even built a horizontal router stand last year just to make my own moulding and trim. I would say the router would be my most used hand tool both in and out of the table. I’m also an avid Sketchup user and design most of the projects and jigs that I build. Sketchup to me is just another tool in the shop. 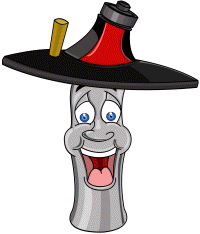 Video 1: Feeler Gauge Principle. Rick provides an explanation regarding brass setup bars, how and where to use them for a variety of applications. He also discusses wooden bit profiles and using wooden setup bars. In this video Rick demonstrate drilling holes accurately with the router, creating your drilling pattern and the proper use of guide bushings. Rick also gives you pointers on what to look for in a good set of guide bushings. AS the title indicates Rick discusses creating a reversible pattern for making a left and right identical part. This video is all about creating a reliable accurate pattern, in a very simple jig so you can make repeatable holes where ever you may require them. Rick demonstrates using your router to make perfectly aligned joints, with a variety of methods to produce the results you’re looking for. This video and Video 7 make the whole series worth the minimal investment. The video demonstrates how to make round tenons on the end of a board i.e. a rail. You will be amazed at how simple this jig is. Video 7 is a continuation of video 6 but in much more detail. It also explains how to construct the jig for angled tenons or double tenons. In summary for a cost of $2.00 a video you can’t go wrong. Thanks Bruce…we just missed Lesson 8 which is showing the construction of a wood bending fixture. This is a simple fixture that is used to make wood bent project pieces…So with these descriptions from Bruce hopefully it will help you decide to join the Jigs and Fixture E-Class. Well here is my first kick at the cat so to speak. We will do more based upon the acceptance of this first E-Class. We have priced this at $2.00 per lesson and once signed up you have the account for the life of this website. The course length is 49 days with one new lesson every 7 days. Well today we are updating the website and releasing the second show of season one. Show 102 is about the linear dovetail joint and features the back end of our router table. To watch the show click on the blue frame below. 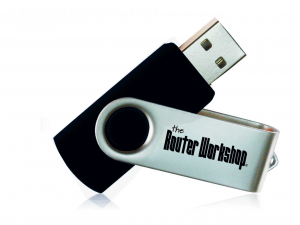 Next, here is a photo of the TRW Flash Drive, Limited Edition. We have purchased a limited edition of these FD and once they are sold we will not produce any more of this type. If you are not interested in owning the High Res Videos but might be interested in owning a rare piece of the Router Workshop history then this is the time to purchase this offer. This FD costs $35.00 plus shipping to your door and includes the first season of the Router Workshop at no charge. What makes this season special.. This season was the first of fourteen seasons and we produced a total of 183 episodes. The Router Workshop was released July 1st, 1995 on many TV networks in North America and season one was the first on the market. Another bit of trivia, the first season is the only season with 14 shows, the rest of the series has 13 shows per season. Does anyone have an old XP Computer? I have been thinking about using or recycling one of our old computers and installing it into the workshop. We have been discussing ways to create a positive airflow through a wooden outside protective case. The positive air flow is used to stop the dust from collecting in the computer case. I want to use my box calculator found at this link to make the custom material list for any computer case dimensions. Then add the bathroom vent fan use to create the positive airflow through the wooden holding box.